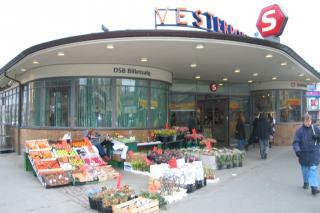 Vesterport Station is the result of a 1930 Act on electrification of the trains in Copenhagen, the S-train system, which also required new stations being built, including Vesterport. The new station buildings were built by K.T. Seest, chief architect at DSB, the Danish state railways. The stations remained true to the spirit of functionalism - simple, practical, no unnecessary decoration and each with its own characteristic colour. In addition to Vesterport Station, several of Seest's other stations are still standing. Nørrebro, Ordrup and Nordhavn Station, for example. Vesterport Station was built in 1934 and reflected the newest trends. The stations were built around an iron structure with plastered walls and steel windows. Facing the street was a spacious entrance between two low curved facades with large transverse bands of windows that displayed the many kiosk goods on sale to entice shoppers inside. This was a new and modern sales technique in the 1930. Ticket offices were given a practical position just inside on the way to the platforms with waiting rooms and a bar slightly further in. The stations, which are at street level, are connected to a low-level platform near the tracks and a covered stairwell. There was both a conventional staircase and the first escalator installed in a Danish station. This escalator rolled alternately up and down. Everything was set in motion for an easy and comfortable journey. Dear Sir/ Madam; I have been looking through your website on Denmark and have been enjoying it very much. On the first of July,I will be travelling from Sydney to Denmark and adjoining a Baltic Cruise. When I return to Copenhagen I will have 3 days at my leisure. I was wondering if you have any hints of where to go Souvenir and other shopping in Copenhagen? Very much looking forward to a well earned holiday of a lifetime! Thank you. Regards, Glenn.